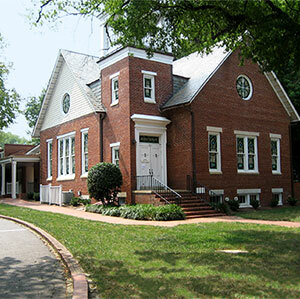 We are located at 211A W. Cameron Ave. just beyond the Carolina Inn. The Graduate Student Center (GSC) is designed to be a central space where graduate and professional students from all disciplines and departments on campus can come together. Shared research ideas, interdisciplinary seminars, professional development activities and meetings are all encouraged. The centralized meeting space will create a stronger sense of community among all graduate and professional students and provide a well-rounded Carolina experience. The Graduate Student Center is maintained by the Graduate School for informal to semi-formal meetings or events related to graduate and professional student education on campus. Please review the Use Guidelines before reserving the space. The GSC is available for use by graduate, professional and post-doctoral student groups and for graduate education events on a reservation basis. Final reservations are made in person or by campus mail only when the Graduate Student Center Reservation Form has been approved by the Director and confirmation email sent to the requestor. All events where alcoholic beverages are served must comply with the University Alcohol Use Guidelines , including having a certified bartender present. Please fill out the Request for Permission Form , including obtaining all approval signatures, prior to reserving the space. For possible seating arrangements, including small groups, conference and theater style arrangements, please view the Graduate Student Center seating plans . The GSC provides access to the UNC wireless system. Please consult the ITS Help Documents on the Wireless Campus Network for further details on wireless access. Technical support for wireless access is not provided by GSC staff. Wired internet access is available upon request. A projector, laptop (wireless enabled), and screen are available for use. Also, a hand-held microphone or lapel microphone is available for use. There is no parking available for general use except for loading and unloading. Metered parking is available on Cameron Ave. Public parking is also available on Franklin Street as well as nearby University Visitor Parking pay lots. Check the UNC Public Safety Department parking maps for more information. Please note that the GSC is ramp-accessible using the back entrance.